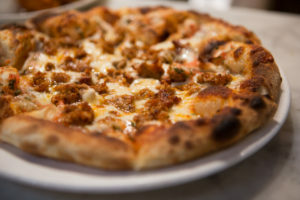 You already know that we offer three different kinds of pizza during lunch and dinner: a pizza del giorno, a margherita, and a cheese pie (which we’ll top with your choice of meat for an extra two bucks). But you might not know that we also encourage you build your own. Just tell us what you want on your pie, and if we have those things in the kitchen, we’ll bake one up for you. It’s a dealer’s choice, but in this case, the dealer is you.